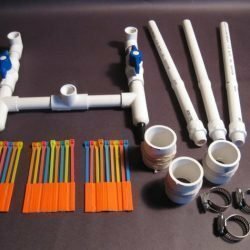 A must have for anyone wanting awesome and cheap backyard entertainment, science project, cub scouts, anyone looking for a new hobby or anyone?that loves model rockets but wants an inexpensive alternative to the usual “fire-in-the-hole” engine rockets! WORLD RECORD SET WITH THESE EXACT PLANS!
? 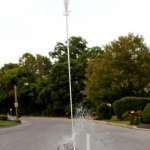 Design, build and launch rockets made out of 1 or 2-liter soda pop bottles hundreds of feet using water and air from a bike pump or compressor.
? Unlike some launcher plans, this one has?a?launch tube?which allows for a?slower release of fuel (water/air)?and allows for?longer “thrust” time. ?It?also gives your soda bottle rocket?more stability?during initial take-off.
? 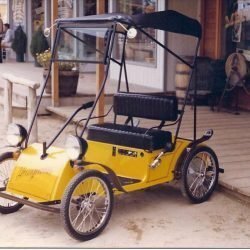 No additional expense since the fuel is water and air! ?Absolutely?NO O-rings?that break and need replacement.
? Launcher supports air pressures as high as 100 psi. 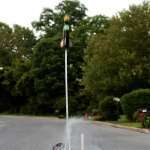 These Soda Rockets really fly high!
? Unique trigger mechanism allows for high-pressure launches (tested @ 100 psi) without rockets prematurely leaving the launcher.
? 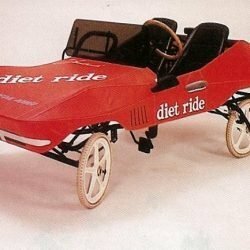 Great for fun, science projects, school classes, parties, etc. and will most likely draw a crowd of onlookers. Encourages creativity with rocket building out of household materials. The need to build bigger and better rockets is unavoidable for most people.
? 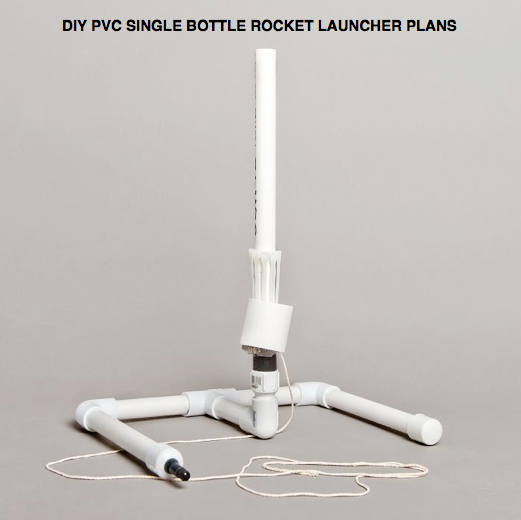 Encourages creativity with rocket building out of household materials. The need to build bigger and better rockets is unavoidable for most people. 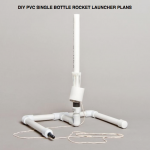 This launcher is designed for homemade water rockets constructed from plastic soda pop bottles. The bottles are one of those rare miracles of serendipity: although designed for something else altogether, they are perfect for making water rockets. Designed to hold liquids at high pressures, they are very lightweight and have a conveniently located ring molded around the neck that’s handy for holding the bottle down while being pressurized. The only thing that could make them better is to have the fins and nose cone molded in for you! A plain bottle is of course aerodynamically hopeless, and tumbles fluffily after burnout, rarely going higher than 60 or 70 feet. But if you add fins and nose weight, transforming the bottle into an aerodynamically stable rocket?then all that initial thrust can be transformed into truly amazing altitudes of over 300 feet. You really have to see it to believe it. You will find that this is a fun activity for anyone to get involved in. Designing and building rockets made out of empty 2-liter bottles allow the creative side in anyone to come out (adults included!). The thrill of having your first “successful” flight keeps you coming back for more. 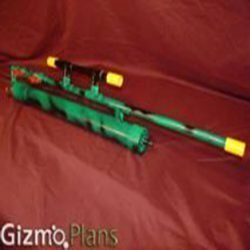 Looking for a new hobby, then you gotta get one of these launchers!